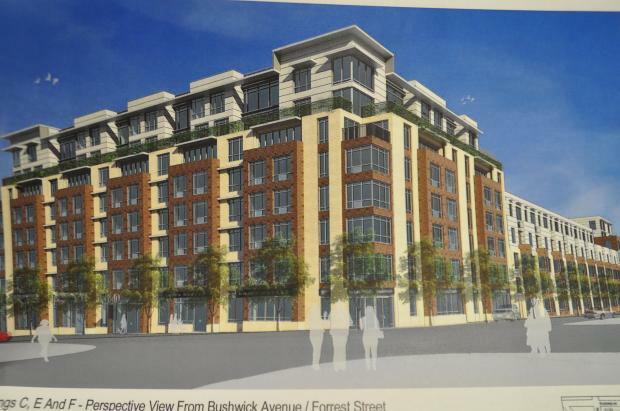 BUSHWICK — The Bushwick community board's recent approval of a controversial rezoning in the neighborhood is under investigation by a local politician for potentially "violating rules" of transparency. Bushwick's Community Board 4 voted to approve a massive development — with sleek high rises, new streets and retail shops near Woodhull Hospital in the former Rheingold Brewery site — at the end of July, city officials confirmed. But the board did not publicize their meeting, a spokesman from City Council Member Diana Reyna's office said, noting that the lack of public notice may warrant a revote. "We are working with the community board to make sure there were no rules violated," said Reyna's spokesman, "and if so we’re open to having another community board meeting to make sure the public is aware of the vote." The voting session — which the blog Bushwick Daily reported was closed to the public completely — did not "turn anyone away" who appeared to witness the meeting, Reyna's spokesman claimed. But earlier this month Community Board 4 District Manager Nadine Whitted confirmed to Bushwick Daily that the meeting had been closed to the public since "it was only a vote and a public hearing already took place in June." There was a meeting in June that addressed the rezoning, but the board elected to table the vote. Whitted and other board members did not return calls and emails requesting comment. Whether the voting meeting was closed or simply not publicized, the board broke the law, State official Robert Freeman from the Committee on Open Government said. "The law requires that notice of the time and place be given before every meeting of a public body including a community board," Freeman said of the Open Meetings Law. The notice must be given to news media, posted in public locations, and, when possible, put on the board's website, he said. But when a DNAinfo.com reporter called the week before the vote, staff in the office said there was no scheduled meeting. In addition, a "vote to rezone...would have to occur in public to comply with the law," Freeman said of the Open Meetings Law. Community Board 4 was also busted earlier this year for illegally hiding information about its votes on liquor licenses. The city's Department of City Planning, however, is already considering the board's rezoning approval as it determines whether the rezoning will be issued. "In making its decision, the City Planning Commission will consider recommendations made and testimony received," said a spokesman from the department, which makes the final decision on the rezoning after receiving a community board's feedback. But Reyna's spokesman said she had "concern over a vote of this magnitude" that was not "transparent" to the public. "If there was anything done inappropriately," he said, "we're making sure it's rectified."